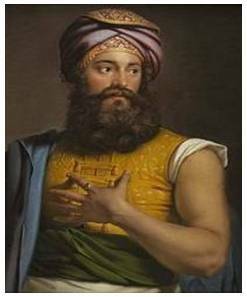 The flamboyant Giovanni Battista Belzoni: a man of his time; and this is very much a story of its time – a story packed with big characters, great archaeological finds and derring-do. At 6′ 7″ tall, he was a jack-of-all-trades, circus strongman, actor, hydraulic engineer, writer, and above all, die-hard adventurer; this colourful Italian became one of the greatest collectors of ancient Egyptian artefacts of the 19th Century – and of some of the most famous pieces in our museums today. Tragically, he died, too young, and almost alone in Africa, leaving his wife living in penury. This is a fascinating story – not often told: ‘The Great Belzoni’ – whose achievements were truly significant and important and very much deserve the telling.